Anyone can easily sign a petition or contact their Congressman about supporting environmental education. But reducing energy consumption is where we all need to come together to do our part. I’m pleased to say Message Systems is pretty earth conscious. Aside from the fact that email saves trees, 50% of the waste businesses produced is composed of paper. It takes 324 liters of water to produce 1 kilogram of paper. 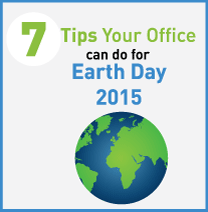 U.S. offices use 12.1 trillion sheets of paper per year and paper accounts for 25% of landfill waste. So sending email actually reduces energy consumption, but we can do more. In fact, one of the first things I noticed on my first day when entering the kitchen was that we have properly labeled compost, recycle and trash bins. Plus, we have compostable flatware for those who brown bag their lunch. 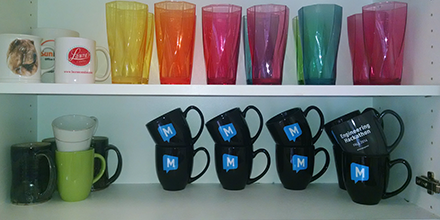 And, everyone uses ceramic mugs for their morning java. Yay! When it comes to getting to the office, some people are fortunate enough to walk, bike or take the bus or train to work, reducing their carbon footprint and energy consumption overall. But the question still remains on what can your office do to contribute to reducing energy consumption? Unplug your monitor before you go home for the day.com says that if you have a desktop computer, powering down the monitor and putting the CPU to sleep if you’ll be away for more than 20 minutes and to power down completely if you’ll be away for more than two hours. Use power strips for older electronics and home offices. Power strips are an easy way to reduce the “always on” power for older devices built before 2008. Devices built after 2008 use very little “always on” power. Turn down the air condition/heat at the end of the day, no sense in cooling or heating an empty office. The Earth Day Network Energy Center recommends to set the indoor temperature to 70 degrees or less in the winter and aim for 75 degrees or more in the summer. Every extra degree will make a difference on your utility bill too. It’s a win-win! Replace any lamps over your desk or cube with ENERGY STAR light bulbs. By replacing just one regular incandescent light bulb with an ENERGY STAR light bulb would reduce greenhouse gas emissions by about 66 pounds. Use cloth towels rather than paper towels at work. The average person uses 2,400 – 3,000 paper towels at work, in a given year. One roll of paper towels is responsible for 25 pounds of CO2, thus contributing to global warming. Recycle all of your paper waste. This includes reusing paper that you’ve only used one side of or that printer sheet that prints out of the printer saying whose print out it is. Recycle your old cell phones, printers, laptops and other electronics. Unfortunately only 20-25% of electronics are disposed of properly, leaving 75% winding up in a landfill. But aside from winding up in a landfill, when you don’t dispose of your phone or computer properly, your data (email, social security numbers, passwords, photos) doesn’t get disposed of properly either and could put you at risk for identity theft, blackmail or forgery. You can find a recycler here or go a step further and have you company become e-Steward certified. Now if your business already engages with its customers using email, you’re already reducing the consumption of energy and natural resources, compared with traditional mail. But you can also reduce the cost of implementing and maintaining an email infrastructure by using our new SparkPost email delivery service. SparkPost.com offers self-service, pay-as-you go email delivery services to developers at companies of all sizes. SparkPost Elite provides dedicated instances, guaranteed high burst rates and white glove service to companies who are already sending significant email volumes.